I recently read a review for Blood Red Road that claimed the Dust Lands series is better than The Hunger Games. After reading such a shocking statement, I raced to get my own copy of the first book. 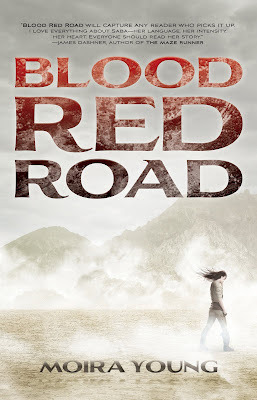 While I can easily compare the two dystopian stories, Blood Red Road didn't quite surpass Suzanne Collins' masterpiece. The story is original and compelling, but I have a few minor issues with the writing. Saba is a harder, less compassionate version of Katniss. While I admired her fierce strength and determination, her lack of empathy kept me at arm's length. Especially in the beginning, Saba comes across as self-centered and uncaring. Thankfully, her character grows as she undergoes traumatic experiences on her journey. I couldn't help but admire her "Angel of Death" attitude. Still, I never came to love her quite as much as I adored Katniss. The writing style is unlike anything I've ever encountered. There are no quotation marks, no proper formats. Improper grammar and spelling proliferate the novel. As a copy editor, my hands were itching to grab a red pen and mark up the countless errors. In the beginning, I nearly gave up on the book because I found the style so distracting. Phrases such as "I says" and "git up" drove me insane. I don't "ezzacktly" enjoy stumbling across such horrific grammar, but that might just be me. Yes, I understand that the style adds to the story's authenticity and such. It's just a little too much for me. The setting of Blood Red Road truly drew me in. From the harsh red deserts to the brutal cells of the cage fighters, every scene is painfully vivid. The novel would make an excellent movie. I visualized every scene with crystal clarity, even the more disturbing ones. I have to hand it to Young- she sure knows how to set the stage. With her motley crew of fighters, she tells an invigorating tale that sucked me in completely. Now, I know what you're thinking. This review is all over the map. Half of the time it sounds like I hated the book, and the other half is filled with words of praise. So, let me lay it all out. I honestly enjoyed the story and the characters. They are incredibly unique and addicting. However, the writing style threw me off. I'd probably recommend this one to any fan of The Hunger Games, but with two warnings: I doubt you will love it more than Suzanne Collins' novels, and be prepared for an onslaught of slang and poor spelling.